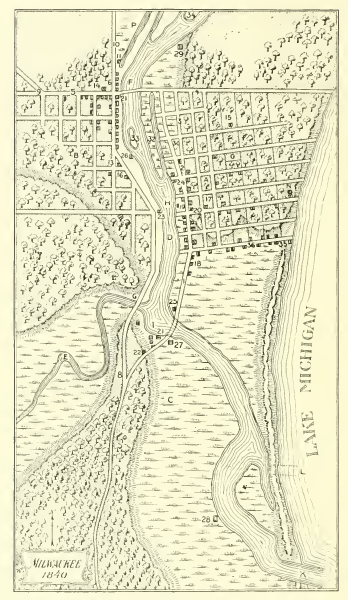 Milwaukee, as it appeared in 1840. The fort, built in 1828 by three companies of the Army’s First Infantry, served as a base of operations during the Black Hawk War. The fort was initially under the command of David E. Twiggs. Twiggs, Buck wrote, “was notorious for acts of cruelty, tyranny, and oppression to those who were unfortunate enough to be under his command.” Even settlers in the vicinity of the fort were not safe, for Twiggs and his officers were “merciless tyrants” and there was no appeal from their judgments in that remote region. Not surprisingly, soldiers deserted frequently. They found shelter and sympathy in Milwaukee, where Twiggs’ cruel reputation was well known. Army fugitives – and the occasional squads of soldiers seeking to arrest them – were commonplace sights in early Milwaukee. As Mason entered the door of the Water Street business, one of the pursuing officers wildly fired two pistol shots into the store. Mason ran through the store, out the back door, and up the riverbank to present-day Kilbourn Avenue where he swam across and made good his escape. A crowd gathered and several urged the immediate lynching of the officers. Others were in favor of simply throwing them in the nearby Milwaukee River. After a few tense minutes, during which the officers were informed, “in language more expressive than elegant, that this was not Fort Winnebago, and that if shooting and torturing soldiers was a common pastime there, it would not be tolerated in Milwaukee,” the officers were released unharmed. 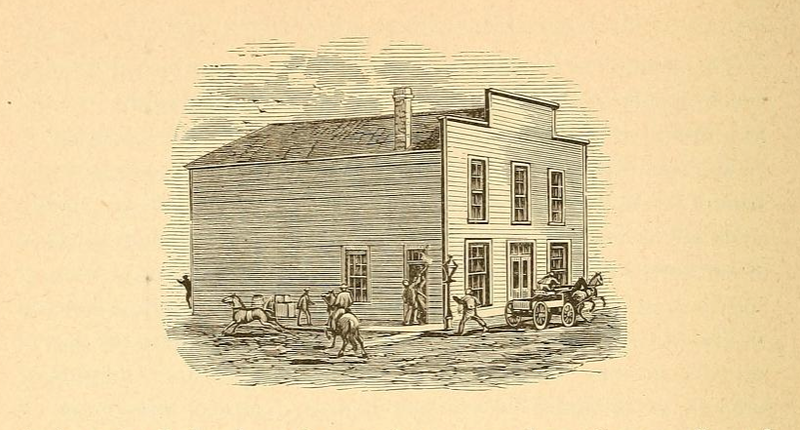 “This, as far as I know, was the last attempt ever made to arrest deserters in Milwaukee, although it was well known that quite a number made their home here for several years. It was a business that did not pay,” Buck wrote. Harrison Ludington, the shopkeeper who delivered that famous ‘slathering calamity’ of a punch, would go on to serve two terms as a Milwaukee alderman, three terms as mayor of the city, and, in 1876, he became the 13th governor of Wisconsin. 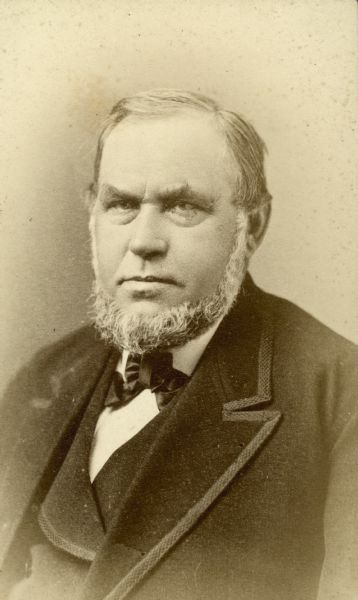 Ludington died in 1891 at the age of 78. He is buried in Milwaukee’s Forest Home Cemetery. Fort Winnebago was abandoned in 1845, and most of its buildings burned in an 1856 fire. A surviving building has been restored and is open to the public on a seasonal basis. The fort’s notorious commander, David Twiggs, went on to serve as a Confederate general in the Civil War. Sources: “Pioneer History of Milwaukee: Volume 3, Milwaukee Under the Charter, from 1847 to 1853, Inclusive” By James S. Buck, printed in Milwaukee in 1884 by Symes, Swain & Co. and Wisconsin State Journal Aug. 30, 1875 edition. Thanks for another interesting story! The map is also interesting. Do you know where I can find the legend? The map is on page 24 and the legend is on page 25. Great post. It reminds of me something fascinating I learned a few years ago: during the second world war, wisconsin housed thousands of german POWs. Many were held at mitchell airport; many others were distributed throughout farming towns, where they stayed with local families and worked the fields. Supposedly a good number of soldiers met long-lost family members this way, and supposedly a group of prisoners who’d escaped from the airport were found a few blocks away carousing at a bar, which they’d been happy to stay at since everyone was speaking german.